Silent Humidifier with large mist output and 322 sq.ft Efficiently Area. Safely moisturizes the air for up to 16 hours of continuous operation. Features easy-to-fill water tank & one-touch control. Quietly releases visible cool mist to return essential moisture into the air. Top-quality humidifier. Higher mist, smaller particle, easier to spread out. Is a Humidifier an Essential Baby Item? Cool vs. Warm Mist Humidifiers - What’s Better? Are There Safety Concerns with a Humidifier? How Do I Clean a Humidifier? Try as we might, our baby will get sick from time to time, and it’s misery. Watching your child suffer through a stuffy nose, congestion, and a sore throat is so hard. Not to mention croup, which is just a terrible experience all around. Using the best humidifiers for baby helps ease upper respiratory symptoms and soothe sore throats while your baby snoozes. Humidifiers are also great tools to treat dry, itchy skin! VicTsing is a highly-rated humidifier designed for baby’s bedrooms. It has so many awesome features that parents love, like the LCD screen that shows real-time humidity levels. The humidifier covers 322 sq. ft, which is probably more than your baby’s bedroom! It’s a great choice for a playroom as well. The LCD screen also shows information like mist output level and water shortage. It makes it incredibly easy to use just as you want. Auto-Shutoff: VicTsing offers timer settings – 1H/2H/4H/8H. Parents love that feature! It also has auto-shutoff protection with an icon flashing when it runs out of water or if the water tank is removed. Easy to Clean and Refill: The 3L water tank lasts up to 10 hours, so it’s perfect for overnight use. To make refilling the water easier, VicTsing uses anti-leakage protection and a convenient nightlight, along with a wide handle for a secure grip. The cap secures tightly. VicTsing includes a cleaning brush as well. Antibacterial Features: VicTsing added anti-bac material to stop any bacterial growth. Adjustable: On the front of the humidifier, you’ll find a dial knob controller that lets you control the mist output, from 0 to 380mL/H. Another nice feature is the 360-degree adjustable mist nozzles that let you adjust in different directions without having to move the entire unit. Noise Level: VicTsing is super quiet. The noise level is at 30 dB, which is quieter than a computer. You never have to worry that it will disturb your child’s sleeping. The Pure Enrichment Ultrasonic humidifier moisturizes the air in your child’s room for up to 16 hours of continuous operation, which is awesome! Most competitors only run for 10 hours at a time safely. Your child will be able to sleep in his bassinet an entire night, getting that necessary sleep to kick the sickness. Auto-Shutoff: This humidifier features an automatic shut-off that turns the unit off when the water level is too low or when you remove the water tank. Easy to Clean and Refill: The 1.5 L water tank is perfect for the bedroom and other small spaces. This unit is a bit trickier to clean. It’s best to fill it with vinegar and water, then add some crushed ice and shake it vigorously. You can also add a bit of bleach. The wide mouth makes it easy to fill. Antibacterial Features: It doesn’t include any filters that need to be replaced, but that also means all of the antibacterial work depends on how often and how well you clean the tank! Adjustable: Parents can adjust the speed settings from high to low, and you can adjust the direction as well. Noise Level: The Pure Enrichment noise level is very quiet. Chances are it won’t disturb your child at all! 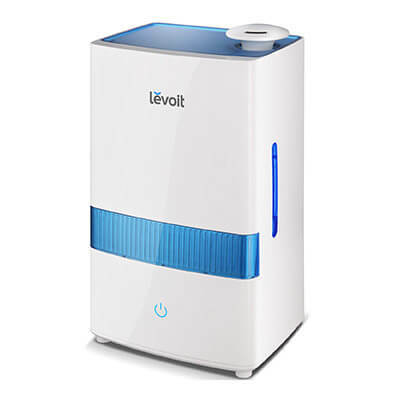 Levoit offers one of the largest water reservoirs on the list, holding up to 4.5 L, allowing up to 40 hours of continuous use on the low mist setting. That’s insane! That’s almost two days straight without needing to refill the unit. It’s a stylish unit that will fit right into the decor of your bedroom. Unlike other units, you can use essential oils with the Levoit. There is an aroma box for the oils, and the fan circulates the oils into the mist, giving you the best scent possible. Auto-Shutoff: There is an automatic shut-off that stops when there is no water detected. Easy to Clean and Refill: You’ll love the 3-inch wide tank opening that makes it super easy to refill without spilling everywhere. The opening also lets you fit in a soft brush or a rag to wipe down the inside of the tank. We also like the sturdy handle on the tank that makes it easy to carry to and from the sink. To properly clean, use white vinegar once a week to prevent any buildup. It also extends the lifetime warranty. Antibacterial Features: Levoit didn’t add any antibacterial features to this unit, which is disappointing! Adjustable: There are three mist levels, with a maximum mist output of 250mL per hour. It has the perfect settings for bedrooms, whether large and small or even an office. The device has a 360-degree nozzle that lets you rotate and decide where the moisture needs to head first. It features different mist settings that you can change with a single button. Noise Level: The Levoit uses the whisper quiet technology that vaporizes, producing very low noise. It’s so quiet that you won’t even be able to hear it’s running! Everyone knows the brand Vicks! Chances are you have used Vicks Rub a time or two when you’re sick. Vicks uses ultrasonic technology to release cool mist to add moisture to the air. You can use it to relieve coughs, congestion, or other dry air discomforts as nosebleeds. This unit runs continuously for up to 30 hours. Parents can put Vicks VapoPads into the Dual SCent Pad slots. These VapoPads add menthol into the air, just like their famous rub, which helps to ease congestion symptoms. Auto-Shutoff: Unfortunately, the Vicks Filter-Free doesn’t have an automatic shutoff feature, which does disturb some parents. Easy to Clean and Refill: The 1.2-gallon tank is easy to fill up! It has a wide tank opening for easy filling and cleaning. Cleaning is easy! All you have to do is take off the tub and use a rag and soap to wash out the tank. Antibacterial Features: This unit is filter-free. Parents can use silver filled cartridge cleaners that simply drop into the tank. These cartridges stop bacteria from growing and keep the unit cleaner for longer. Adjustable: You can adjust the mist control with the customized output settings. 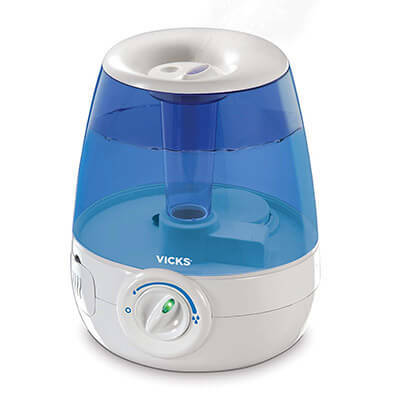 Noise Level: Vicks offers a quiet humidifier that won’t disturb your child’s sleep at all. It’s not totally silent, but it has a steady, soft whirring noise. Some babies really enjoy that type of white noise. Koios may be the most expensive choice on our list, but it also has the most features available. With a 4L tank and the ability to humidify a room up to 322 sq ft, it’s the Cadillac of baby humidifiers. You can run the unit for up to 16 hours continuously, which is perfect for overnight sleeping! We love the humidity sensor that detects the indoor humidity in real time. Set your desired and comfortable humidity mode based on the environment. The ideal level is 45 to 60 percent humidity. Auto-Shutoff: While the Koios will shut off if the water level empties, we also like the built-in timer. You can program this humidifier to run from 1 to 12 hours at a time, and it will automatically shut off when the timer turns off. Easy to Clean and Refill: For easy cleaning, Koios added a wide opening that lets you reach all of the nooks and crannies that could harbor bacteria. Instead, you can reach these areas by hand. We love that! 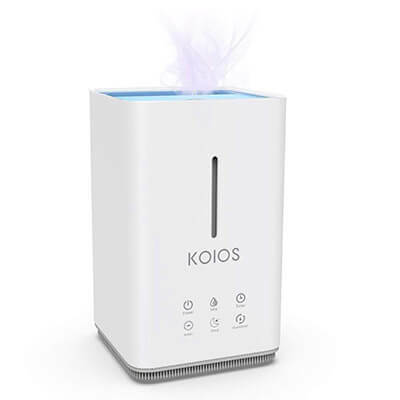 Antibacterial Features: Koios uses a three-stage filtration that removes limescale and any germs in the water for a pure, fine mist. Adjustable: Koios offers three different humidity levels – low, medium, and high. You can set whatever output you want for that season! Noise Level: The whisper quiet operation and the silent fan stops any noise that might disturb your sleeping baby. Koios lists that the noise level is less than 35dB, which is similar to a computer. We consider a humidifier essential, especially as you enter cold and flu season. Sure, you can do without and everything might be totally fine! Some parents dislike the cleaning process and don’t want to take the time. A clean humidifier is important, otherwise, you are just spraying mold and bacteria in the air – gross. However, humidifiers DO ease cold symptoms, and why would you want to prolong your child’s sickness if you have a tool to make it better? You want to kick that sickness ASAP so your baby goes back to her happy self and you can finally get some rest again. So, we say yes – humidifiers are essential! When you go shopping, you are likely to find two basic types – cool mist and warm mist. Both essentially do the same thing – add moisture to the air. 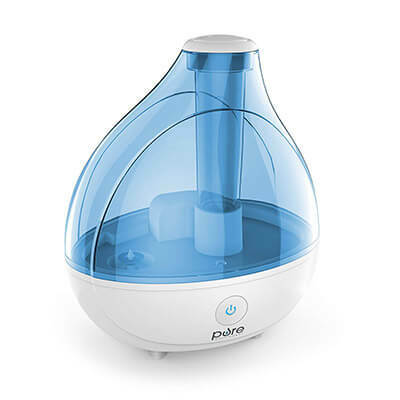 Cool mist humidifiers are recommended for use around small children due to safety. You don’t want your baby or toddler to accidentally be burned by the steam or hot water! However, there are reasons why you might want to consider a warm mist humidifier instead. Most importantly, the high heat kills most bacteria and potential allergens before expelling the steam into the air. If you have a child with severe allergies or asthma, a warm mist may be more beneficial. A humidifier can help ease and take away the symptoms of a cold naturally. When used in conjunction with medicine and ample rest, you can kick a cold faster. How does it work? It helps to thin the mucus making it easily expelled. The moisture soothes a dry throat and reduces the severity of a cough. Moistens the nasal passages and promotes faster healing. On top of those awesome benefits, humidifiers also keep the air most in your home, which slows the ability of airborne viruses to travel. So, keeping a humidifier running in your house can actually help prevent your family from getting sick. While humidifiers are generally safe, you do need to be aware of a few things! Burn Risk: If you do pick a warm mist humidifier, you have to make sure your child stays away. They could potentially be burned by the steam or hot water. Cleanliness: Mold and bacteria do have the tendency to build up in these units. If your unit uses a filter, make sure that you clean or replace it as often as the manufacturer states. Spraying mold or bacteria filled steam into the air can lead to unwanted health issues, especially for immune-compromised kids or those with asthma. Over-Moisturizing: Sometimes, adding too much moisture into the air can be a problem. It can lead to mold and other dangerous allergens growing in your child’s room or throughout the house. It may be wise to purchase a hygrometer to watch the moisture level in your room or home. The ideal levels are 30 to 50 percent, but 43 percent is perfect if you want to stop the travel of airborne bacteria and viruses. Always read your manufacturer’s specifications on cleaning. In most circumstances, cleaning once a month with bleach is adequate. How often it needs to be cleaned will depend on how often you use it and the quality of water that you use. Using tap water will increase the frequency in which you need to clean your humidifier. All of the humidifiers on this list are less than five gallons. You should wipe it out after each use. A simple wipe with a rag will do. Aim to sanitize every week or every other week. Make sure that you always fill your humidifier up with cold water, not hot. Hot water has more minerals, which creates scale inside of the humidifier. Mineral deposits are like a breeding ground for bacteria and mold, which is exactly what you don’t want. Using distilled or demineralized water reduces those problems. Even if you don’t use all of the water in the tank, make sure you empty it each day. Look at the instructions and follow what the manual states. If you don’t have a manual, use a brush or rag to clean the inner walls. You can use vinegar or hydrogen peroxide to clean the inside as well. Make sure you rinse several times. Clean or replace filters as often as indicated. When comparing humidifiers, there are a few features that we believe are more important than others. Here are the criteria we ran the 5 choices through to see how they stood up next to each other. Auto-Shutoff: Having an auto-shutoff is an important feature that stops the humidifying process when the desired level is reached. This feature saves electricity and helps to avoid damage to the appliance. Easy to Clean and Refill: An ideal humidifier has an easy to remove water reservoir that makes cleaning and refilling much easier. A few other features that you might like include a wide mouth for filling (spilling water everywhere is never fun) and a carrying handle. Antibacterial Features: Due to the nature of humidifiers, they can be a breeding ground for bacteria. Frequent cleaning helps to get rid of that problem, but antibacterial features, like filters, cartridges, or ultraviolet lights, prevent mold and bacteria from spreading throughout your baby’s nursery. Adjustable: We prefer to have an adjustable humidistat that lets you keep the humidity in the room at your desired level. Cheaper versions often don’t include any type of adjustability. Noise Level: Is your baby a light sleeper or can she handle some noise? Some babies like the sort of white noise that humidifiers create. What you really want is simple. 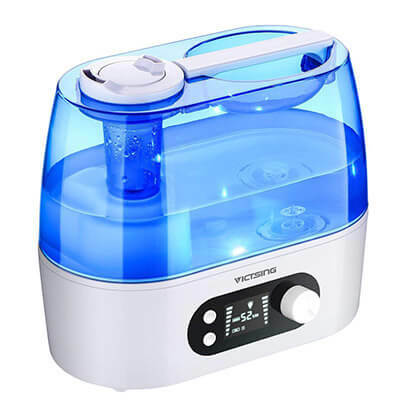 You want a humidifier that is easy to use, easy to clean, and easy to refill. The goal is to keep you and your family healthy, not add additional stressors. Using a humidifier is one of the best things that you can do when your child has a cold. Adding moist air can make your child more comfortable and help them heal faster. It’s well worth the cost!